A prime goal during kitchen remodeling (sometimes the only goal) is changing the look of the cabinets. Surprisingly often, cabinets that are otherwise in good structural shape are demolished and replaced simply because the homeowner is tired of their look. This is similar to getting rid of a perfectly good car just because you don't like its color. In many situations, you can dramatically change the look of your kitchen by a process known as refacing, which gives most of the benefits of cabinet replacement but at a fraction of the cost. Cabinet refacing is essentially a replacement of the cabinet "skins"—replacing the doors and drawer fronts and applying a new veneer over the existing surface of the body ("carcass") of the cabinets. The hardware—the hinges, handles, and drawer pulls—are usually also replaced during refacing. Cabinet doors are removed; drawers are removed and their fronts are removed (the rest of the drawers boxes remain intact). The front portions of the cabinet boxes are covered, either with natural wood veneer or RTF (Rigid Thermofoil), a melamine-based product. Cabinet sides are skinned with wood veneer or laminate. New door hinges are added, if necessary. Hinges in good condition can also be reused. New doors and drawer fronts are installed. New handles, drawer pulls, and other types of fixtures are usually installed. Existing hardware can also be reused if it is in good shape. Optional accessories, such as crown molding, glass panels, lighting, or storage accessories are installed. Day 1: Remove hardware, doors, and drawer fronts. Begin veneering. Pick up and clean at end of the day. Day 2: Continue veneering. Pick up and clean at end of the day. Day 3: Finish veneering. Install new doors and drawer fronts. Install hardware. Make final adjustments. When doing this work yourself using kit materials, allow yourself a full week, at least, for the work. Sturdy box construction made of plywood or MDF panels that are smooth and in good condition. New veneers require smooth solid surfaces in order to adhere properly. Face frames of solid hardwood. Good hardwood face frames will accept veneers and can solidly anchor new doors. Internal hardware (drawer tracks, internal storage elements) that are in good shape. If the drawers do not operate smoothly or if the cabinets are lacking in shelving or storage accessories, the expense of refacing may not be worth it. Refacing cabinets cost less than replacing your kitchen with custom cabinets, but don't rush to cabinet refacing on the assumption that it is a dirt-cheap alternative to new cabinets. Generally, refacing performed by an installation specialist costs about 50 percent of the cost of a new custom cabinet installation and about 70 to 80 percent of the cost of installing stock cabinets purchased off the shelf from home improvement centers. Costs for a professional refacing for a typical 10 by 12-foot kitchen begin at $1,000 to $3,000 for laminate veneers, but can go as high as $2,500 to $6,000 for real wood veneers. 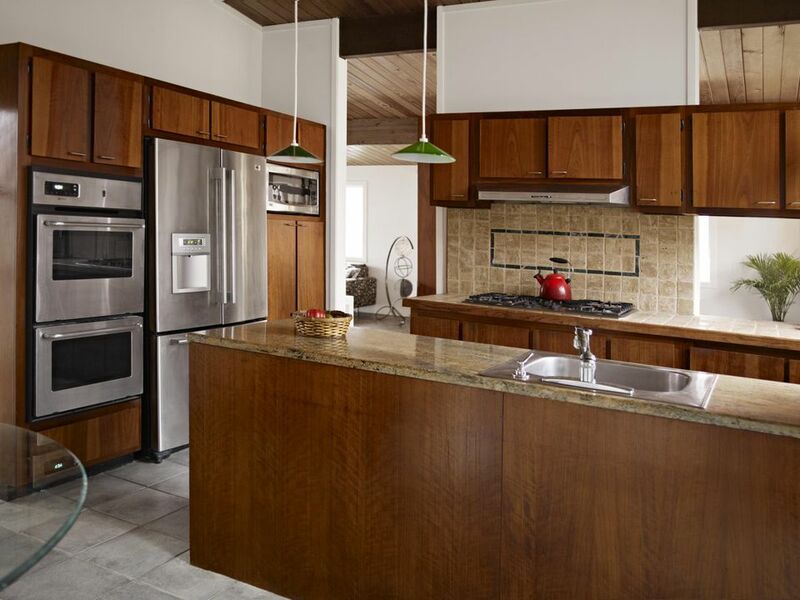 Costs upwards of $9,000 are common for larger kitchens using top-quality wood veneers. Hardware can cost you an additional $2 to $50 per piece, depending on how luxurious you want to be. By contrast, all-new cabinets can be installed for $4,000 to $5,000 for off-the-shelf stock cabinets, or upwards of $20,000 for new custom cabinetry. ...costs about 40 to 50 percent less than a full kitchen. So an average size full kitchen generally costs $12,000 to $20,000 while a refaced kitchen of the same size is usually $7,000 to $10,000. Cost savings are somewhat more for the DIYer able to perform the refacing. Expect to spend $200 to $500 for the veneer materials, plus the costs of new doors, drawer fronts, and hardware. The advantages and limitations of cabinet refacing should be carefully considered when weighing options for your kitchen remodel. Refacing is a green remodeling option. Refacing keeps cabinet boxes away from the landfill—a great advantage considering that many cabinet boxes are made of MDF, which contains formaldehyde, a hazardous chemical. It also prevents more trees from being cut down to construct new cabinet boxes. Cost savings. Refacing usually gives you the look of new cabinets for about half the cost of new custom cabinets. But costs need to be carefully considered. Retains the kitchen layout. Refacing is perfect if your current kitchen layout meets your needs. Many style options. Many dozens of different veneer options exist, both for laminates and natural woods. DIY option is challenging. While possible, veneering is an acquired skill that should be tackled only by patient, skilled DIYers. Installing cabinet doors and drawer fronts, however, is fairly easy. No layout changes are possible. If your kitchen needs a footprint change, this is not the option for you, since refacing does not allow for changing the layout or adding countertop space. Box interiors do not change. If your current cabinets are lacking for shelves or other storage features, updating them to meet storage needs may involve significant extra expense. Dingy interiors will need to be painted. Wood veneers require finishing. Installing natural wood veneer requires additional steps for staining and varnishing. Costs can add up. By the time you add new doors, drawer, fronts, hinges and hardware, and interior storage accessories, refacing may not save you much over the cost of installing new off-the-shelf stock cabinets. An online search will give you the names of many firms that perform cabinet refacing services. Cabinet refacing contractors tend to be local firms specializing in these services, not national franchises. You can also discuss your needs with a consultant at a big-box home improvement retailer, who can arrange for services from one of their affiliated installation vendors. For DIYers, some options for buying refacing materials include Facelifters (Home Depot), Cabinet Doors Depot, Wise Wood Veneers, and DIY Kitchen Refacing Supplies. Cabinet refacing can be a good, cost-saving option for kitchen remodeling if the existing cabinets are well-constructed and in good shape, and where a radically different look is desired. It is also a good choice where the existing kitchen layout works well as it is. But where the existing cabinets have structural problems, or where hardware is in poor condition or internal storage features are lacking, you may be better off installing all-new cabinets.